After finishing a successful 4½-2½ score at the Chicago Open, IM Amon Simutowe granted an interview with The Chess Drum in his hotel room. Deeply engrossed in playing blitz chess with GM Hikaru Nakamura, he broke away to find 15 minutes to tell the chess world about recent developments in his chess aspirations. "I had Ra5, Bd4, g5, Kd2 and he had Rb3, Kd6, Bd5, g6, a2. (see below) So he played Rb4 leaving a chance for Bc5 check and taking the Rook, but quickly took back the Rook to b3. After a minute or two he played it somewhere. So what was strange after I told him to play his Rook to where he intended to… he started shouting and called a witness. One of the guys I overhead him laughing with when I blundered a pawn, was a witness. This guy claimed to be independent even though they had been chatting during the game. Unfortunately he was closest to the table and his word carried weight. One other guy supported Anka. 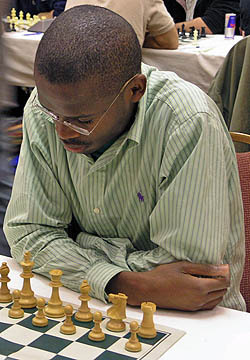 IM Amon Simutowe during his game with GM Emil Anka. The game ended in a touch-move controversy. Photo by Daaim Shabazz. We continued with his new move. After some more moves, I eventually tricked him and captured the a-pawn. Now the position was dead drawn. With a g5-pawn I could defend with my bishop and g6 he could defend with his bishop. The Rooks couldn't do much. I had about 30 seconds or less on those clocks which don't show the time (analog). He had about two minutes. He continued playing hoping to flag me. He blundered and I captured his bishop. I was still losing on time… maybe fifteen seconds left. Then he made an illegal move. They gave me an extra two minutes and that's how I closed him out. It was strange that he tried to flag me even at a point when the game was dead drawn." 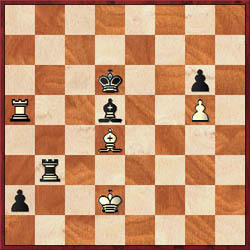 Simutowe-Anka arrived at this position before the controversy. Simutowe contends that Anka played … Rb4 which loses immediately. A dispute ensued. Simutowe could have even vouched for the "no losing chances" rule, but nevertheless, it appears that justice was meted since Anka showed a disrespect for his opponent. Simutowe's game against GM Anatoly Lein was never played. Lein, who had slugged out a long draw with GM Dashze Sharavdorj of Mongolia, refused to play. Simutowe started the clocks without his opponent present and then began to walk around the hall. Find out the whole story by listening to the interview!